Supergroups are a dime a dozen these days (Them Crooked Vultures, Monsters of Folk, etc.) Seems as if musicians are banding together through the recession, just as they did in the late 70s and early 80s (Asia, Damn Yankees). This doesnt necessarily mean the music will be better, after all...too many cooks...as the saying goes. This one seems more organic than the others to me. 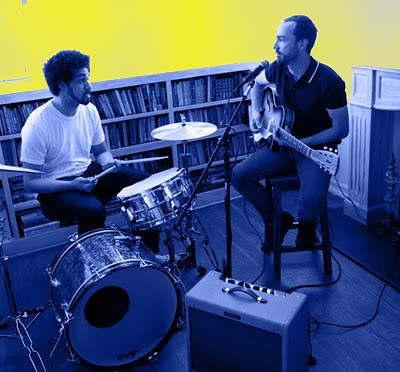 Broken Bells is the prolific producer Dangermouse (Gnarls Barkley) and James Mercer of the Shins. Dangermouse has been working with stars of the indie rock stratosphere (Beck, Black Keys) with some degree of success... so teaming up with Mercer isn't an unexpected move for him. The results of their collaboration work out well on this first single: The High Road. All of Dangermouse's idiosyncratic bleeps and squirts which he flourishes his music with works well to contrast and compliment the hyper melodic songwriting of Mercer, whose aerobic voice can reach around just about anything. Nothing seems forced about this song, and that's why it works so well. On behalf of Columbia Records, Monotone and Broken Bells, many thanks for plugging "Broken Bells" / the artists’ eponymous album on your site (street date 9th March) ... thanks, also, on behalf of the label, management and artists for not posting any pirate links to unreleased (studio) material and, if you / your readers want good quality, non-pirated, preview tracks, then full length versions of "The High Road" (as already featured by you) and "Vaporize" are available for fans and bloggers to link to / post / host etc at www.brokenbells.com ... .. for further details of the new album, special pre-orders, on-line promotions, videos and 2010 shows, check-out the official site, as well as the artists’ MySpace at www.myspace.com/brokenbells and YouTube channel at www.youtube.com/brokenbells ... .. and keep an eye on these official sources for details of further news, preview material and on-line promotions.